The circuit diagram illustrates the application of the Thordar-T-20C73 Speech Filter in a typical amateur speech amplifier and driver unit. This compact audio band pass filter has been specifically designed for amateur, police, and emergency radio service. It provides several worthwhile operating advantages when installed in the speech section of transmitters employed for voice communication. The main requisite for communication work is signal read-abiliyt and intelligibility, not "broadcast quality". Extensive tests have proven that adequate speech transmission can be obtained with no noticeable reduction in articulation by employing an audio band of approximately 200 to 3500 cycles. This band pass range has been employed in the Thordarson T-20C73 filter. The advantages gained by utilizing this bandwidth restriction are two-fold: First, the attenuation of all frequencies below. 200 cycles permits an increase in the modulation level of " those frequencies which contribute the most to signal readability. In explanation, the audio frequencies lying below 200 cycles contain a large share of the speech energy and, therefore, are the first to cause over-modulation. However, as these frequencies contain only a small percentage of the signal intelligibility, they can be readily eliminated so as to confine the modulating power to the middle register which contributes the most to signal intelligibility. The suppression of a voice frequency above 3500 cycles results in little reduction in articulation. The advantage gained by this action is that it limits the number of high frequency side bands transmitted, causing the phone signal to occupy less spectrum space. This results in a reduction in adjacent channel interference and will aid materially in producing additional room for stations in the congested amateur phone bands. The filter also provides the added advantage of suppressing the effects of hum pickup which often occurs in the low level speech amplifier' stages. This same unit may also be advantageously inserted in the audio amplifier circuit of communications receivers. Tests have shown that the amount of interference noise passed by a receiver is proportional to its audio band width. By employing this speech filter to limit the audio response range, high pitched heterodynes and other extraneous signals will be suppressed. Electrically this unit has been designed to work from a source impedance of approximately 10,000 ohms as afforded by medium Mu triodes (6C5, 6J5, ^6SN7, or triode connected 6J7) to a 100,000 ohm grid circuit or to a 500 ohm line. When employing the 100,000 ohm output tap, a 1 to 3.15 voltage stepup will be realized through the filter. The 500 ohm line tap is provided for connecting to a low impedance line when the low level speech amplifier section is located on the operating desk or at a point' remote from the driver and modulator sections. The 20C73 Speech Filter will, function satisfactorily at any signal level up to approximately 8 db which corresponds to 10V RMS measured across the 100,000 ohm filter output circuit. In all applications the plate circuit of the tube connection to the filter input must be shunt fed. A plate blocking condenser will not be necessary as it is incorporated in the filter cirquit. The circuit shown in the schematic diagram comprises an effective amateur speech amplifier and river unit due to the excellent voltage regulation of the oilput signal. This desirable driver characteristic has been obtained by using a 6AS7G twin triode tube which possesses a very low AC plate to plate resistance. This tube is capable of supplying a clean 10 watts of audio power which is adequate for driving any of the popular Class B modulator tubes having output ratings up to 500 watts. The voltage gain of the unit is quite adequate for high impedance dynamic or crystal microphones. Thé speech amplifier illustrated has been constructed on a 7" x 15" x 3" chassis base. All of the large components, such as the transformers, filter condensers, and tubes are mounted on the top of the chassis. The one exception is the filter choke, which has been mounted on the underside directly beneath the power transformer. If any other mechanical arrangement of parts is employed, be sure to locate the speech filter and the interstage transformer well away from the power transformer and filter choke to minimize hum pickup from these sources. The circuit wiring is simple and straight-forward. The manner in which the chassis ground and the B minus return circuits are connected will have a large bearing on making the low level stages hum-free. 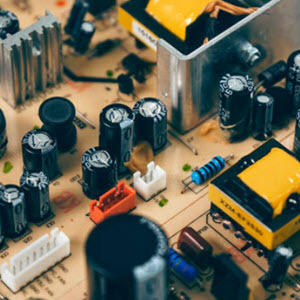 Precautions to observe are as follows: Insulate the electrolytic filter and decoupling condenser cans and also the microphone input connector from the metal chassis. The B minus circuit wiring should be started at the power transformer high voltage center tap. Then progressively join together the B minus circuits of each stage as indicated on the schematic diagram by the heavy line until the 6SJ7 input stage is reached. At a point adjacent to the GSJ7 socket, connect the B minus circuit to the metal chassis. It is important to make only this one B minus circuit connection to the chassis to obtain hum-free operation. Use shielded conductors at the points shown in the schematic diagram. The choice of an output or driver transformer for the 6AS7G stage is dependent upon the location of the speech amplifier in relation to the rest of the transmitter. If the speech amplifier is mounted within several feet of the Class B modulator stage, a driver transformer should be employed and the secondary leads connected to the Class B grids by a length of three conductor cable. Select a stock Thordarson driver transformer with the correct stepdown ratio for the particular Class B tubes being employed. To determine the correct driver ratio, refer to the information supplied in the driver and modulator combination chart contained in your latest Thordarson 400 transformer catalog. If the speech amplifier is located a considerable distance from the modulator chassis, use stock output to line transformer T-22S70, The. 500 ohm secondary of this transformer can then be matched to the Class B grids by employing a T-20D84 multi-match 500 ohm line to grid driver transformer.